Let’s get this out of the way up front: Dead Island was no one’s game of the year. Containing the original game released in the Fall of 2011 and all of its DLC, a more appropriate title for this set would probably have been Dead Island: Complete Edition. But marketing semantics aside, does this reanimated game deserve your time and money, or should it be put down for good? Dead Island gained a lot of popularity last year because of a very striking and dramatic trailer featuring a family fighting for their lives in reverse. If that trailer is all you know about the game going in, you’re in for a pretty rude awakening – not only is that particular family nowhere to be seen (other than a slight nod to their hotel room hidden at the beginning of the game), but story in general takes a definite back seat to the action. In fact, I’d say the story in general is largely forgettable and is only there to give you the most basic excuse to slaughter hordes of zombies. Basically, you wake up in a resort on Banoi island after a night of drunken partying to discover almost everyone is now dead and craving your brains. You choose to play as one of four characters – Sam B., the washed-up rapper, Xian Mei, a spy for the Chinese government, Logan Carter, an ex-football player and Purna, a former Sydney police officer. Each have a weapon specialty, and this is a far more important criteria to choose your character than whatever backstory they may have since those never play a role in the game anyway. Whichever character you choose, the story plays out exactly the same. In fact, the major cutscenes of the game magically have the other 3 characters you didn’t choose suddenly joining you as if they had been there all along. The game is played from a first-person perspective, but for the most part this is not a first-person shooter. Your primary weapons are melee weapons, and almost anything you find can be used as a weapon. Weapons are broken down into categories – bladed, blunt and guns. 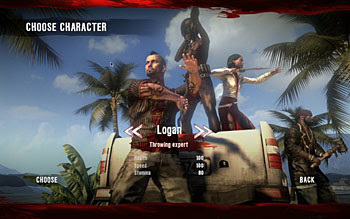 Each character specializes in one type of weapon (with the fourth character, Logan, specializing in throwing any melee weapon). However, all weapons can be used by all characters, they just have abilities in their skill trees to enhance whichever type they specialize in. It’s very important not to try to stick to just one type, as they all have their uses and some enemies are more easily taken out with one than another. In addition to weapon attacks, which are performed with the right shoulder button, every character has a kick attack. This is probably the most important move in the game because it will stun and sometimes knock down zombies. Kicking a charging zombie to stun him before delivering your attack is the biggest strategy of the game. Combat generally works well, but sometimes due to the first-person perspective enemies can get behind you and do a good bit of damage before you realize what’s happening. You do have a directional damage indicator, but especially at higher levels it doesn’t take enemies long to deal significant damage to you. Progression is completely quest based – you complete quests, level up, rinse & repeat. You will advance through 4 major areas during the course of the game – the resort, city, jungle and prison. Each of these areas is huge and offers a ton of opportunities for exploration. While the game world is open in that you can revisit almost any area at any time, the missions primarily move you forward so that there’s little reason to revisit past areas once you’ve left them. There are collectables to find in the form of IDs and Banoi facts. You are also offered side quests along the way – a lot of them, in fact. These are useful to help you level up and gain rewards such as new weapons, money and blueprints. The blueprints, some of which can also be found scattered around the island, are used to modify your weapons. The money you find will also primarily be used in maintaining, upgrading and modifying your weapons, which can be very expensive. You usually find plenty of money to cover your costs, though paying for these repairs and upgrades is very strange since you’re not actually paying anyone, you’re paying a work bench. Components are also required for these modifications that are often much more difficult to come by than the money, which makes having to also pay for the upgrades seem redundant and unnecessary. Pretty much everything you do in the game earns you experience – killing zombies, completing quests and completing challenges. Challenges are in-game goals (some are tied to trophies, but the majority are not) that typically involve killing a certain number of a certain type of zombie, or killing zombies using a certain weapon. Earn enough experience and naturally you will level up, which increases your stats and gives you one skill point to spend in 3 skill trees. Some of these skills are nice, but I found (playing as Sam B. at least) that too many of them were useless. You often have to spend points in these useless abilities to unlock the useful ones further down the tree. Worse than this is the way the game levels zombies to match your character’s level. This really takes away from the feeling of accomplishment that usually comes with leveling up in RPGs since no matter how strong you are, the zombies are never any easier to kill. Oh, where did you guys come from? Unfortunately, the game has more than its share of issues. Throughout the game my current weapon would unequip itself, usually at the worst possible moment. There’s also a strange bug where if you have any alcohol in your inventory when you use your last health pack, the alcohol will automatically be equipped in place of your weapon. Since you’re typically using health packs in the heat of battle, this inevitably leads to using your last health pack then hammering the attack button which makes you drunk complete with blurry shifting vision. Not ideal for staying alive. Fortunately there are frequent checkpoints and your only real penalty for dying is a loss of a percentage of the money you have on you at the time. The more money you have, the more you lose, so the best strategy becomes to spend a lot so you’re never carrying too much. Regardless of the penalty, death can become extremely frustrating. Later in the game, it’s easy to die and never see what hit you. Enemies constantly respawn, and especially in the city where they are more concentrated you can go through an empty area only to have them spawn in behind you and kill you before you know they are there. Enemy AI is another issue. I often think some companies make zombie games just because they can skimp on the AI under the excuse that “zombies are stupid”. And true enough, having the zombies either shamble towards you or charge you at a sprint (depending on the type) feels right enough, even if it isn’t very smart. Where things really start to fall apart is with the living human enemies, or “punks”. This is where most of the shooting of the game comes into play, since guns are largely useless against zombies but very effective against the living. The problem is, the enemies all take cover and then go into a loop where they peek their heads out at the exact same spot, take a shot, and go back into cover. So all you have to do is aim where their heads will be when they peek out and wait. They almost never move to different cover or advance on you, so generally fighting humans is a lot easier than the zombies. The game looks pretty good overall, but again there are some issues. The environments usually look very nice, with lots of detail and color. The resort is probably the best in this regard, but the others all offer something unique and are fun to explore. Enemies look appropriately gruesome, and the game has more than its fair share of blood and guts to go around. Character models, especially in cutscenes, are another matter – the NPCs make characters from the Elder Scrolls games look like fashion models. Stiff hair that clips through their heads, eyes that bug out grotesquely and jerky animations make the mercifully sparse cutscenes more frightening than anything else you’ll see in the game. There are other issues as well, most notably severe texture pop-in when you load into a new area, but these are more forgivable in light of how good the overall game looks. Sound is pretty average across the board. Zombies make the typical moans & groans, and weapons make sickening thuds when you connect with them. The music has its moments but generally stays in the background, which I can’t really complain about. Voice acting is the low point here, with lots of fake accents and an extreme use of profanity that would make Tarantino blush. So does the good outweigh the bad? Yes…but just barely. Questing is addictive, and the huge island is generally fun to explore. The game clocks in at close to 40 hours if you do all of the sidequests, and by the end of that time you’ll probably be ready to see the credits roll. The rough edges do bring the experience down, however. The game can often be frustrating, and the lack of a real feeling of growth due to the enemies leveling along with you makes the grind often seem pointless. Having a bland, uninteresting story that’s poorly voice acted removes any story-based motivation to push forward. Plus the bugs and graphical issues too often work against you. But every time I was ready to quit out of frustration, one of the hooks of the game would pull me back in. There is a good game here, but you have to be prepared to put up with a lot of bad to find it. Hopefully next year’s sequel will see these issues addressed. I played the PS3 version of Dead Island: Game of the Year Edition for this review. It is also available for the 360 and PC. Total playtime was about 38 hours. I played single-player only, and I did not play any of the DLC included in the package. Who do you VOO doo….Argyle?